How Would Your Life Be Different if You Chose a Different College? My dream is that someday a virtual reality machine will exist that will let you go back to a crucial decision in your life, make a different choice than you did, and relive your life (fast forwarding as needed) following the alternate path. The machine would work Inception-style in that you could relive years of your life in the machine in mere minutes in reality. Grown-up Jamey taking wedding photos at Wash U.
I have several significant decisions that I always wonder about, some more scandalous than others, but one that comes to mind every now and then is the university I chose to attend. I was very fortunate that my family had the resources (also thanks to some financial aid) to attend Wash U here in St. Louis. Of all the campuses I visited, this one just felt right. The number one determining factor was that I was truly challenged by the first-level Japanese class I sat in on during my visit, while second-level classes at other universities were easy in comparison. I had a good time at Wash U, I fell in love with St. Louis, and I had probably the best year of my life when I studied abroad in Japan. Also, Wash U looks much better on my resume than any of these other school. But it also costed a lot of money when I could have gotten a comparable education elsewhere, I missed out on the thrill and camaraderie that comes with rallying around a D-I sports team, and there are certain social and educational aspects that I struggled with. So, just for fun, I thought I’d quickly mention the other schools I applied to and got accepted into. I feel like I should include the University of Virginia on this list, but my memory is failing me–I can’t actually remember if I applied there. I always considered it a safety school, so maybe my memory is tricking me into thinking that I would have been accepted there, but I really don’t know. Thus in the name of accuracy, I’ll just list the schools that I know for sure I got into and could have attended, as well as how things might be different now if I had attended those schools. 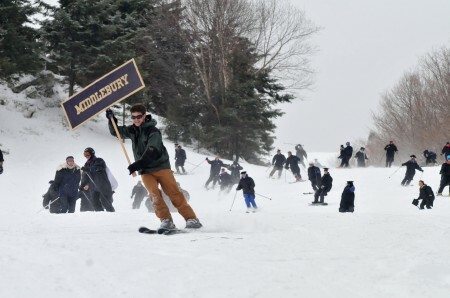 This is how they receive their diplomas at Middlebury. Really. William & Mary: I’m from Virginia, so this would have been by far the least expensive of the schools I could have attended. College debt hasn’t weighed me down, but I wonder how nice it would be to not have to worry about it at all. Other than finances and location, the only thing I know would be different is that my sister and I might not get along as well as we do now because she also went to W&M. I think we needed a little space after high school, and I’m so grateful for the relationship we have now as a result of that space. Macalester: I had by far the worst college visit at Macalester because it seemed like no one actually wanted to be there (to the point that just now when I looked up how to spell the school, I was genuinely surprised that it still exists). It was cold, everyone smoked, and the dorm rooms seemed like prison cells. The one redeeming value was that there was a 24-improv marathon going on when I was there, and I don’t think I’ve ever laughed that hard for that long. So many if I had gone there I would have had a lot of funny friends. 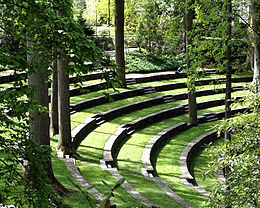 If Harry Potter went to college, it would be at a place like Swarthmore. Swarthmore: I was very pleased to get into Swarthmore because they have such a low acceptance rate. The campus is absolutely beautiful, like some sylvan hideaway in the woods–it’s another town where “there’s nothing to do here.” I think I would have been overwhelmed by the wealth there. Not the school’s wealth; the wealth of the students. But I think it’s the type of place where I would have had a somewhat magical college experience and walked away with lifelong friends like the people in The Big Chill (I just saw it for the first time this weekend–highly recommended). I also think it’s the type of place where a lot of streaking happens. I’ve never streaked, but it seems like the kind of thing I’d enjoy in large groups. So perhaps I would have ended up in a nudist colony after attending Swarthmore. Overall, I’m very happy and grateful for the path I chose, and I don’t dwell on the past. But I certainly am curious about it. How about you? What were your other college choices? Is there any one in particular that you think would have led you down a very different path? This entry was posted on Tuesday, May 29th, 2012 at 12:02 am	and is filed under personal and tagged with personal. You can follow any responses to this entry through the RSS 2.0 feed. I’ve often considered the same question. My college search was very narrow; at the time I thought I’d want to stay in Virginia forever, so I applied to The University of Richmond, University of Virginia, William & Mary, and The University of Maryland (for their geography program). I looked at UNC, Duke, and a few other VA schools, but my choice ultimately came down to UofR vs. William & Mary. I almost applied to any Ivy League or two, but I realized (at the time) that my motivation was more about being able to say that I’d been accepted to an Ivy League school than any real desire to attend one of those schools. Knowing what I know now about my fierce penchant for exploration and travel (which I discovered shortly after entering college my freshman year), I wish I’d applied to some west coast schools. I always wonder what it would have been like to go to Stanford. I love California, and occasionally I do muse over how my life would be different if I’d played that one key decision differently. Ha ha…I remember Chris thinking about UVA that way. The funny thing is, I’m sure Chris (and you) could have gotten into any school you wanted to. That’s a really interesting point, tying your love for travel and exploration into a curiosity about a west-coast school. I wonder if your life would have been all that different, though. There’s still a decent chance you would have wanted to live by the ocean after that and even travel to Australia. Maybe your life would have ended up very similar. Hmm…I can’t remember why Jon didn’t have the right tie. 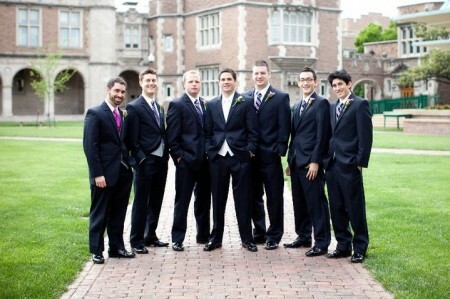 By the way, is there a story behind the one guy who didn’t get the memo about the matching ties at Mark’s wedding? Can you let me know when that virtual reality machine is available? I’d like to see what my life would be like if I had went to Spain instead of getting married. You should have gone to Middlebury or Swarthmore, either of which would have opened as many (or more) doors than Wash U. On the East Coast, both of those schools are a bit more prestigious than Wash U. Interesting. Wash U is much higher ranked, but it’s true that it’s not known well outside of the midwest and academia. But you’re probably right that attending one of those schools would have opened more doors–I bet there’s a greater sense of kinship at those schools given their small size and semi-secluded location. Ranked higher by whom? They’re in different categories in US News (Wash U #14 in national universities, Swat #3 and Midd #5 in national liberal arts colleges). Wash U is the better choice for someone who wants a more urban college experience, while Swat is better for the suburban crowd and Midd the rural aficionados. All are amazing colleges! That’s a good point–it depends on the rankings. I guess I just give a little more sway to the university rankings. Maybe that’s just my perception. 🙂 I’m sure Swarthmore and Middlebury are producing excellent students. If I have chose a different college, I’ll probably have a BS and a Master’s combo and doing occupational therapy across the country. Well, time to hit the books again to do that. Swarthmore looks awesome! So many naps and tent camping would have happen on that ground for me. 🙂 And I don’t even like camping. I’m glad you’re still following your dream, Jasmin. That’s a good reminder that no matter the college we went to, it’s not too late to make any of the things we fee like we “missed out on” still happen. I applaud you for doing so. And for those of you who might be young enough to still go there and are interested in a music business program, here’s a link. It’s pretty darn awesome… guest speakers include Yoko Ono, the CEO of Sony, the CEO of Project Playlist, the VP of EMI records… basically a who’s who in the music industry. I went to the University of Dayton and could not have been happier. I had thought about transferring to Notre Dame after my freshman year (and I actually took some initial steps towards it). Looking back though, I found exactly the right friends at UD – including finding someone my first night there who is still a best friend. I do wonder about Notre Dame, though. It’s a family thing – 4 of my 5 older siblings graduated from there (and my sister-in-law, too). But then I wouldn’t have experienced parties in the ghetto or have cultivated the friendships with my Ohio peeps as much as I have. Elaine–Thanks for your comment. I’m glad you found happiness at UD. I would wager that part of that has to do with UD, and part of it has to do with your ability (I don’t know you, but I’m assuming here) to find happiness wherever you are. I think some people might be miserable at any college or city or job, while others make the best of their circumstances and find the good in them. I love that there was an alternate timeline in Felicity! How cool. I have seen Sliding Doors and liked the concept. It’s done nearly to perfection in two books as well: Replay (which I’ve written about on the blog) and The Post-Birthday World. Both are excellent.